The second job that Tom Tom won is even more ironic. As you might know, the company was selected by Apple to power the Maps app that will replace Google Maps on iOS 6. The new Maps application for iOS will include millions of new points of interest, local business information, real-time traffic and accident information. If traffic is slow for one reason or another, the app will suggest alternative directions. Because the new Maps app will be integrated with Siri, Tom Tom will be the brain of Siri when it comes to answering question like, "Where is the closest gas station?". Apple's new Maps app will also include a 3D Flyover look at cities and other places, similar to Satellite view on Google Maps. 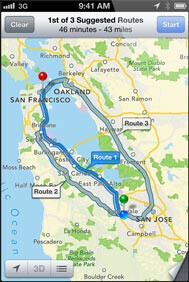 Flyover and the turn-by-turn navigation will work only Apple iPhone 4S and Apple iPad 2 or above. "After 300 yards, keep to the right, then, stay in the right lane. After 300 yards, keep to the right, then, turn left." So apples "new" app will have almost nothing over the competition outta the gate ... priceless. 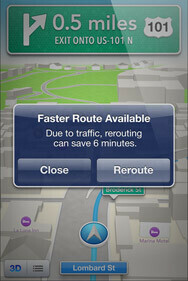 Will IOS now allow "off-line" turn by turn navigation too? How many countries? And before the deal with Apple there were other deals as well. In a timeline: - TomTom powers all HTC phones with "HTC directions" - TomTom brings maps to Samsung bada - TomTom brings maps and traffic to BlackBerry - TomTom brings maps and "related information" (secret) to Apple Apart from that, there are many apps using tomtom data. Most commonly known is Google maps, but also Mapquest, Cygic, and some others. HTC Locations in my android sensation is powered by ROUTE66 Google maps does not rely on tomtom for anything unless they share the same source themselves. Using google maps will show the source of the data at the bottom right, and for most of the US, it shows Google alone. Apple navigation is still the best. Android copied Apple, as usual. Just like Republican Mitt Romney deserves "credit" for the auto bailout huh?